Car theft is a larger threat in some cities than it is in others, but it’s a crime that occurs just about everywhere. According to data from the FBI, one car is stolen in the US about every 43 seconds. Other sources peg the annual cost of stolen vehicles in the US at between 5 and 6 billion dollars. Since your car is probably one of the most expensive things you own, chances are good that you’ve given at least a passing thought to the subject of car alarms. The main purpose of a car alarm is to deter theft, which can be accomplished by either scaring off would-be thieves or simply rendering the vehicle inoperable. Car alarms have come under fire for being less than effective, and even the most complicated devices can be bypassed by intelligent criminals, but there is evidence that a good car alarm can provide protection against crimes of opportunity. At least one type of sensor. Some type of noise-making siren or flashing lights. A control unit to make it all work. If you look at a very basic car alarm system that includes only these three components, it's pretty easy to see how the whole thing works. In the most basic system possible, the sensor would be installed in the driver's door, and it would be wired to activate whenever the door was opened. With the system armed, opening the door would send a signal to the control unit. The control unit would then activate the siren, calling attention to the vehicle and hopefully scaring off the would-be thief. In practice, car alarms are often much more complicated. Most car alarms include radio receivers built into the control units, transmitters that take the form of key fobs, and a wide variety of different kinds of sensors. They can also be tied to a variety of vehicle systems, which can result in a number of effects. What Are Car Alarm Sensors? Car alarm sensors are the eyes and ears that the control unit uses to tell when someone is trying to break into the vehicle. These sensors work in a lot of different ways, but they all serve the same basic purpose. Door sensors are the most basic and common sensors available, and they're found in virtually every car alarm system. These sensors can be installed in the doors, trunk, and hood of a car, and they allow the control unit to sense whenever someone opens anything up to gain access to the vehicle. The reason door sensors are so common is that they usually tie right into switches that are already present in your car. If you've ever noticed that your dome light turns on and off when you open and close your door, that's caused by the same spring-loaded door switch that car alarms typically tie into. Variations on this theme are hooked up to the door handles, which allows the control unit to sound the alarm the moment anyone touches the handle. While door alarm sensors are usually pretty easy to install, they aren't foolproof. The biggest issue is that all a thief needs to do to bypass this type of sensor is to smash a window and climb in without opening the door. Both pressure sensors and microphones operate on the same principle, but they serve slightly different purposes. Microphones detect the ambient sound level, which allows the control unit to monitor for sounds like breaking glass that indicate a theft in process. Pressure sensors work on the same basic principle that microphones do, but they are set off when the pressure in the vehicle changes. Since breaking a window or opening a door will trigger a pressure change, this type of sensor can be relatively effective. These sensors send a signal to the control unit if the vehicle is jostled in any way, and there are several different types of them. Some are mercury switches, and others are more complicated. Certain shock sensors are capable of communicating the severity of the movement to the control unit, which can then decide whether to set off the alarm or just issue a warning. Since these sensors can be tripped by just bumping against a vehicle, they are often set off accidentally. It’s also possible for someone to trip this type of sensor on purpose for malicious reasons or their own amusement. Most car alarm sensors are designed to prevent the theft of an entire vehicle, but some thieves are just after parts. For instance, a thief will sometimes jack a car up and remove its wheels. While a shock sensor may go off during this type of theft, motion sensors are designed with this exact type of scenario in mind. When a motion or tilt sensor detects that a vehicle has rotated or tilted beyond a certain point, even if it was moved very slowly, it will send a signal to the control unit to sound the alarm. This is usually accomplished with a mercury switch, but there are other designs as well. This type of switch is less likely to register a false positive from someone accidentally bumping up against the car. Sirens are the most recognizable feature of car alarms, and they are also the most annoying when a car alarm goes off accidentally. The volume of car alarm sirens varies from one system to another, but they are typically loud enough that it is very unpleasant to drive a vehicle around when one is going off. The idea is to draw attention to the vehicle, which may cause the thief to abandon the vehicle for an easier target. A variant on the siren theme is the car alarm that has a set of speakers. These car alarms will play a prerecorded message if a proximity or movement sensor goes off. 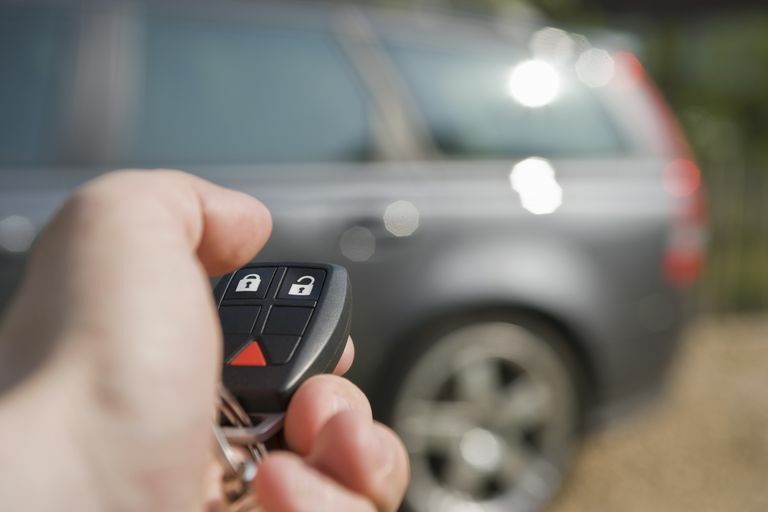 While an experienced car thief probably won’t be deterred by this type of system, it may be jarring enough to scare off an opportunistic would-be criminal. Many car alarms also make use of existing vehicle systems. Some are capable of honking the horn, and others will flash the turn signals. The ignition system can also be tied into the alarm, in which case it may be difficult for the thief to start the vehicle without extensive knowledge of that particular alarm. control unit that processes sensor inputs and triggers the alarm. handheld transmitter that can arm and disarm the system. receiver that provides that information to the control unit. Since car alarms are often tied to many different systems, some packages include a variety of useful features that aren’t directly related to theft deterrence. Some common features include remote starting, keyless entry, diagnostics like code reading, and remote vehicle status via telematics. Some of these features are also available via services like Lojack and OnStar. The primary argument against car alarms is that they end up being a whole lot of sound and fury signifying nothing. False alarms are rampant, and we, as a society, have become more or less desensitized to the sound of a car alarm since we're so used to hearing them go off. It's also true that, while car theft is still rampant, the actual number of car thefts has trended down each year for the last several decades. According to the Insurance Information Institute, motor vehicle theft fell about 58 percent between 1991 and 2013, and the trend has continued through to this day.